Two years ago, when looking for a new learning opportunity to engage their students, Mark Schoenlein, a long-time board member with Penta Career Center, discovered Formula Student USA. However, the junior-racing program came with a cost—one his school couldn’t entirely afford. That is, until Honda entered the race. Penta Career Center in Perrysburg, Ohio, offers comprehensive career technical classes to 11th- and 12th-grade students from 16 local school districts. Available career programs include auto tech and collision repair, powersports, welding, advanced manufacturing, CAD design, IT, and marketing. 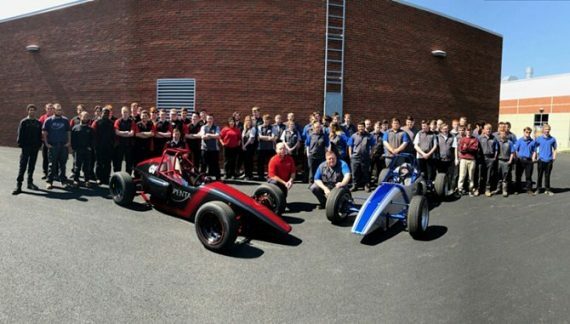 So Penta’s program supervisor, Phil Stockwell and course instructors Chris Neff and Bob Anderson, along with Schoenlein and fellow advisory committee member Greg Herr, recruited 70 high school students to participate in Formula Student USA. Unfortunately, one constant was present: Each needed safety equipment and electronics to get moving, both of which the center couldn’t afford. That’s where support from Honda R&D Americas (HRA) provided a green flag. Oftentimes, companies such as Honda will sell or donate discontinued engines to schools, giving students the opportunity to work hands-on with updated technology. In this case, Penta applied for grant support from HRA to purchase safety equipment, such as gloves, jackets, pants, and helmets, as well as computerization tools. Split into a Red Team and Blue Team representing the auto and powersports programs, the Penta students were the only representatives from Ohio at the Formula Student USA race in New Castle, Indiana. As an added bonus, Penta’s two teams—coincidentally racing the only Honda-powered vehicles—had the only cars that didn’t break down during the event. A Penta Red Team driver even went on to turn in the fastest lap of all competing teams, and the cars were featured on the front page of a local paper. “It was a fantastic learning experience for our students and staff, as they were able to see the fruits of their year-long labor,” said Schoenlein. “Thank you, Honda, for your support and for making this grant available. There are so many great stories of student collaboration, learning, and personal growth that came from this project.” One of those stories was Eric’s. The Penta teams worked diligently with Eric, who uses a wheelchair, to create a hand-control system for operating a vehicle, which he could then push and pull with his hands instead of his feet. “Our intent with our programs is that everyone be included,” Anderson said. And in true Honda fashion, the students had a “Challenging Spirit” to make sure that was the case. At first, their hand-control system didn’t work. But they didn’t give up, modifying their vision and coming up with a solution that would allow Eric to drive the car. “He took it out and when he came back, he was just beaming,” Anderson recalled. And it is projects such as these that Penta wants to use to open up other students’ eyes to what STEAM-based careers have to offer. “A lot of the interest in doing this program was to show students that may or may not have been successful in a traditional high school that STEAM careers are about more than, say, algebra,” Stockwell said. Penta leadership, too, was sad that that the “fun journey” had concluded. But they are also quite proud of what they were able to accomplish. And so was HRA. “Honda is very proud to be able to contribute to such an awesome project and help change the lives of young students,” Samantha Lynch, HRA’s Community Relations Group Leader, said. “Just as our founder Mr. Honda said, sharing a vision for growth and inspiration is what truly brings fulfillment.” That certainly proved to be the case for the pride of Penta, from the adults who helped start their racing program to the students who took it all the way to the finish line.